In technical communication, discussions on how to best prepare graduates to meet workplace challenges range from responding to changing technology and occupational needs to focusing on creating flexible workers. Part of this conversation centers on expertise: what kinds of expertise are most valued and how can graduates be trained to be experts? In this article, we explore our field’s understandings of expertise by focusing on a recent master’s graduate and practitioner, Megan. As first an intern then a full-time employee at HP Inc, Megan experienced clashes between the classroom and workplace, which she sought to reconcile. In addition, she also had to learn to assert herself as a subject matter expert (SME) while working alongside SMEs. This navigation was not something her education necessarily prepared her for, and when compared to surveyed graduates’ experiences, may be something programs could emphasize. 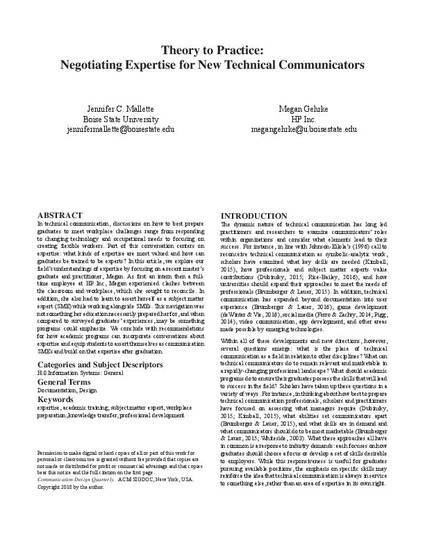 We conclude with recommendations for how academic programs can incorporate conversations about expertise and equip students to assert themselves as communication SMEs and build on that expertise after graduation. This document was originally published in Communication Design Quarterly by the Association for Computing Machinery. Copyright restrictions may apply.